The <input> tag is used to accept the data from the user. The <input> elements are used inside the <form> element. It is used to declare the input controls that allows user to enter the data. To depending on the type attribute, an input field can change in many different ways. The <input> tag supports the Global Attributes and Event Attribute. HTML 4 is supports ”align” attribute. HTML 5 is not support an “align” attribute. 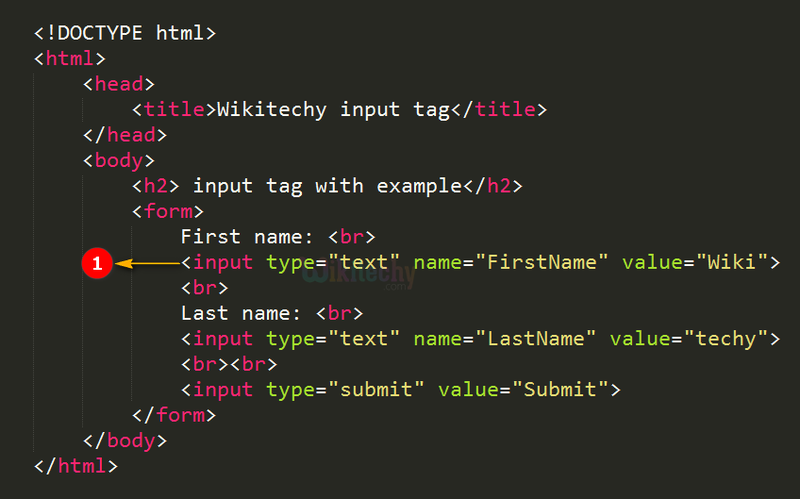 The <input> tag has several new attributes in HTML 5. The type attribute has several new values in HTML 5. The <input> tag is used to get the inputs from the user. 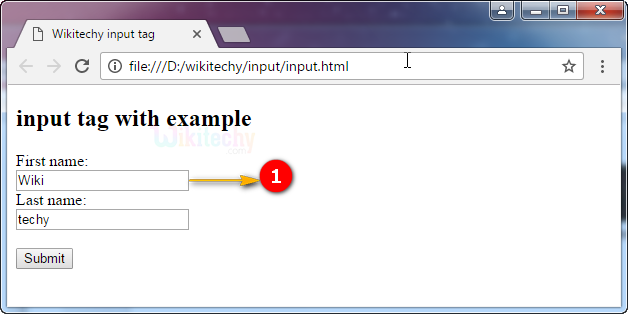 The output shows the input textbox with the value “Wiki”. media_type Yes Yes It is used to specify more than one value. The values will be separate by using comma. bottom Yes No It is used to denotes the alignment of an image input. maxlength number Yes Yes It Specifies the maximum number of characters allowed in an <input> element. name text Yes Yes It Specifies the name of an <input> element. value text Yes Yes It Specifies the value of an <input> element. checked checked Yes Yes If type=”radio” or type=”checkbox” it will already be selected when the page loads. disabled disabled Yes Yes Input control disable. The button won't accept changes from the user. It also can’t receive focus and will be skipped when tabbing. alt text Yes Yes Defines an alternate text for images. readonly readonly Yes Yes It Specifies that an input field is read-only. size number Yes Yes It Specifies the width, in characters, of an <input> element. src URL Yes Yes It Specifies the URL of the image to use as a submit button (only for type="image"). form form_id No Yes It specifies one or more forms. formaction URL No Yes It denotes the URL of the file that will process the input control when the form is submitted. text/plain No Yes It specifies how the form-data should be encoded when submitting it to the serve. post No Yes It defines the HTTP method for sending data to the action URL. formnovalidate formnovalidate No Yes It defines that form elements should not be validated when submitted. framename No Yes It Specifies where to display the response that is received after submitting the form (for type="submit" and type="image"). height pixels No Yes It Specifies the height of an <input> element (only for type="image"). list datalist_id No Yes It refers to a <datalist> element that contains pre-defined options for an <input> element. date No Yes It Specifies the maximum value for an <input> element. off No Yes Defines whether an <input> element should have autocomplete enabled. autofocus autofocus No Yes Denotes that <input> element should automatically get focus when the page loads. date No Yes It Specifies a minimum value for an <input> element. multiple multiple No Yes It Specifies that a user can enter more than one value in an <input> element. pattern regexp No Yes It Specifies a regular expression that an <input> element's value is checked against. placeholder text No Yes It Specifies a short hint that describes the expected value of an <input> element. required required No Yes It Specifies that an input field must be filled out before submitting the form. step number No Yes It Specifies the legal number intervals for an input field. width pixels No Yes It Specifies the width of an <input> element (only for type="image").